"After graduating college with a BA in Studio Art, I worked in a doctor's office for 10 months. Very quickly I realized that I really needed to do something creative with my future. I wanted to find a way to use the skills I had learned in college and felt that jewelry could fulfill that desire. Coming to CIJT has been one of the best decisions of my life. 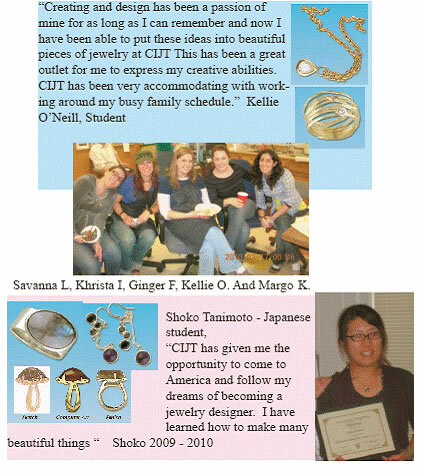 I am a studio jewelry designer now in my home town, Suffern, NY after spending 6 months as an apprentice at CIJT after completing the six-module program." - Margo Konikoff, Suffern, NY. Note: Margo's first show in New York resulted in 12 personal sales. Congratulations, Margo! "As you know, the MasterValuer™ Program is the first answer I give to any aspiring individual looking for education in the area of the Appraisal Sciences, particularly in the field of Jewelry Appraising.The MVP course is the best investment one can make, bar none, because of the information available in the course and the time it takes to complete and mostly because of the quality of the instructors involved. I am continuously recommending the program." –Barry S. Block, GG, CSM-NAJA, ASA, Master Gemologist Appraiser® Registered Master Valuer #1051402, President/Founder The Jewelry Judge, Ltd.